Jury service is one of the most important components of our justice system and ensures that we truly have a government of the people, by the people, and for the people. Jury service is a direct means for citizens to participate in the judicial process. It gives each of us access to equal justice under the law. The jury trial system and due process of law protect the lives, liberty and property of the general public. The attorneys at Davis Law Group and our clients have a tremendous respect for those who sacrifice their time to in order to be a juror in a civil trial. We know that jury service is hard work and that jurors must sacrifice both personally and professionally in order to fulfill their civic duty. Jury service is an important part of our American heritage. The fundamental right to trial by jury is guaranteed by the United States Constitution. 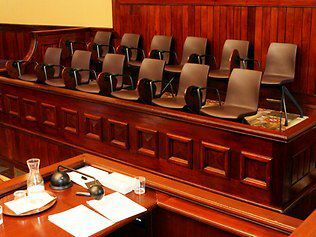 The Sixth Amendment provides for impartial jury trials in criminal cases. The Fifth Amendment guarantees the right to a grand jury indictment. The Seventh Amendment provides for juries in certain civil cases--such as personal injury cases. Our office is frequently contacted by students, from elementary school to law school, who wish to learn more about the jury system. We do our best to return every phone call and answer every email from students who are researching the American justice system. However, sometimes our schedules do not allow us to respond to these requests as quickly as we would like. This jury service page was created to help answer student questions about the role that juries play in civil law. Eight Months In Jail For Juror Who Used Web To Contact Defendant, NPR The Two-Way, June 16, 2011. As jurors go online, U.S. trials go off track, Reuters, December 8, 2010.